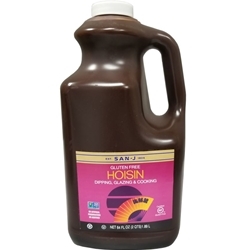 San-J Hoisin Sauce is delicious as a BBQ glaze for meats and vegetables. Use it in your favorite stir fry noodle dish and fried rice. It's robust flavor is savory sweet and slightly salty, making it a versatile sauce. Ingredients: Brown Sugar, Water, Red Miso (Water, Soybeans, Rice, Salt, Alcohol), Molasses, Tamari Soy Sauce (Water, Soybeans, Salt, Alcohol), Apple Cider Vinegar, Garlic Puree (Garlic, Water), Ginger Puree (Ginger, Water, Salt), Plum Juice Concentrate, Spice, Arrowroot, Inactive Yeast. This product contains soy ingredients.